The Ferraro Family donated $1500 to the Jacksonville Police Department Boots on the Ground Program. The money came as part of a goodwill offering after the family’s annual Christmas Concert, held in December at the Annie Merner Chapel. The family was awarded “honorary officers of the month, for the month of December” by Chief Mefford. 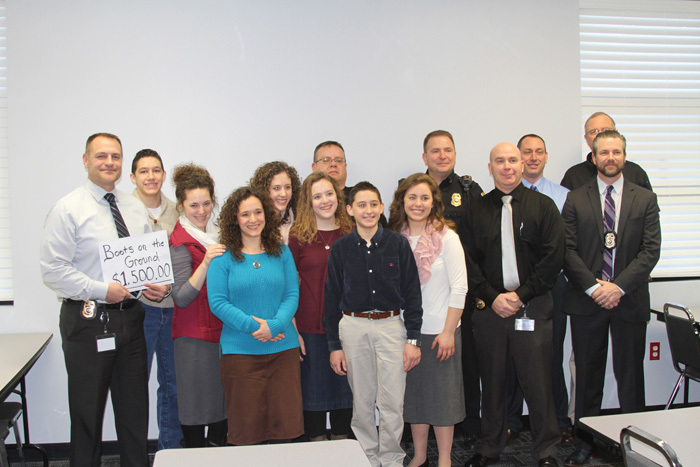 From left to right, Chief Adam Mefford, Joel, Anna, Grace, Maria and Elena Ferraro. Patrolman Andy Coop, Ben and Bethany Ferraro. Sergeant Brian Baptist, Lieutenant Doug Thompson, Detective Jason Bryant, Detective Sean Haefli and Pastor Alan Braddish.